There has never been an easier way to gather up pebbles at the beach to leave a message behind in the sand or to declare your love for your significant other. 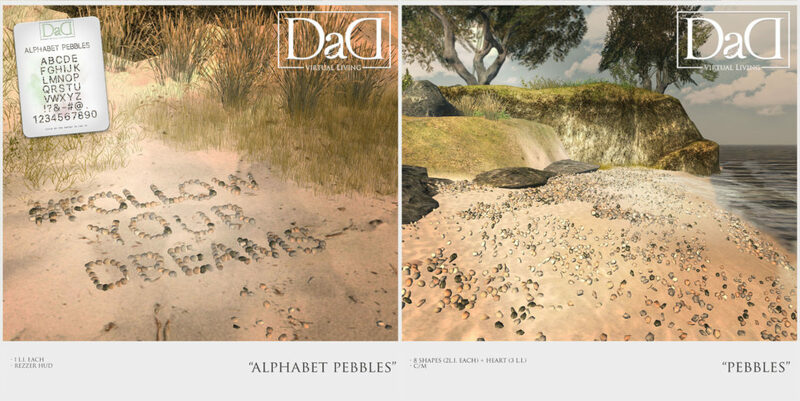 The ‘Alphabet Pebbles’ is a wearable rezzer that allows you to rez each letter of the alphabet, numbers and symbols. Mixed colored hues of grey, brown and charcoal pebbles smoothed out by the natural elements of the ocean are available in 8 shapes and 1 heart shaped design. These beautiful stones are perfect for any beach setting, ponds, gardens, driveways and even scattered around trees.